If you’re like me, you spend a lot of time thinking about food when you travel. And if you have kids, you know they spend even more time having food fights on vacation. Well, I have good news and bad news for you. The bad news: No article will end the struggle. The good: I can help you minimize the conflict. I’ve been on the road with my kids for years, and I have a few ideas. A little planning, creativity, and curiosity can bridge the divide between adults and parents — not to mention avoid a food fight. 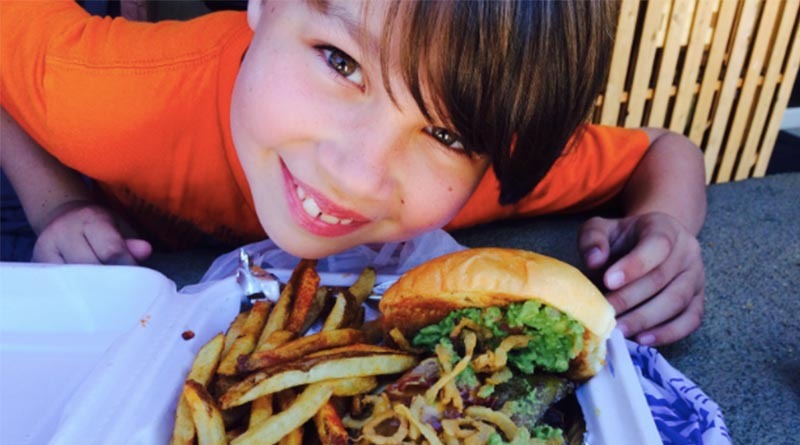 Iden Elliott on the last stop of our burger tour of Santa Fe, N.M. Some travelers like to experience their food spontaneously. Others plan. If you’re traveling with your family, you’ll definitely want to prepare. Why? Because, as I’ve told my kids on numerous occasions, if you don’t make plans, then plans will be made for you. Put differently, resolve any disagreements before you get to the restaurant or grocery store. No fighting about food in public. Many travelers don’t like to cook while they’re on vacation, and that’s fine. A five-minute session with Yelp, Google, and the kids can usually result in a meal plan everyone can agree on. One of our favorite concepts involves the food tour. That’s where we make multiple stops at restaurants or coffee shops, trying the same dish. In Seattle, we stopped in a dozen coffee shops one afternoon. The kids tried a pastry and I went for the espresso. In Santa Fe, we sampled six different chili burgers one afternoon. That was fun. In Chicago, it was hot dogs. Turning food into a theme — and an adventure — makes the vacation more memorable. You can do this in Philadelphia (cheesesteak), Memphis (barbecue), Austin (tacos) or New Orleans (gumbo). A word of warning from someone who is willing to try almost anything: When it comes to definitions of “hot” and “spicy,” palates vary. I can almost still feel the burn of the chili I tasted in Santa Fe. It was nuclear-hot, even though the server assured me it was only “hot.” I’d hate to taste very hot. 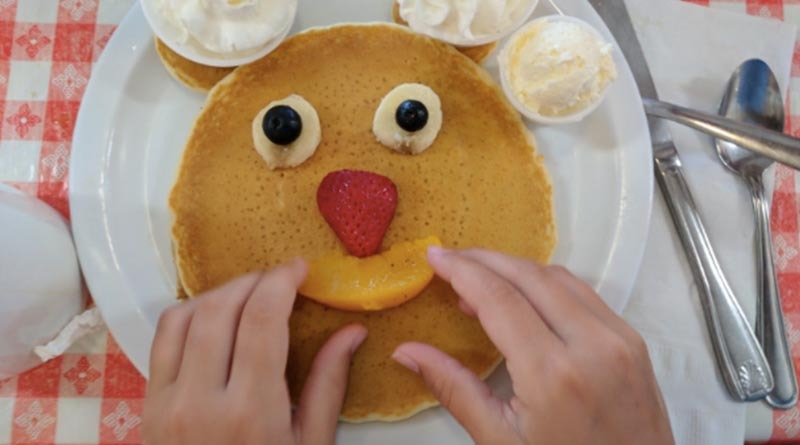 Iden Elliott adjusts a smiley face on pancakes at Ellen’s Danish Pancake House in Buellton, Calif. If you’re on the road almost nonstop like I am, you learn that routines are not your friend when it comes to food. If you feed your companions the same thing every day, they’ll eventually stop cooperating. Fighting about food is inevitable. For my 13-year-old son, being uncooperative means declaring that everything I make is “disgusting!” And for my 11-year-old daughter, that means refusing to eat. Nothing is more exasperating than having unhappy kids at the dinner table. ✓ For breakfast, we loved our recent stop at Ellen’s Danish Pancake House in Buellton, Calif. The smiley-face pancakes are tasty. And fun. ✓ For lunch, we adored the Low Country fare at Red Bone Alley, in Florence, S.C. For some reason, that always seemed to be our halfway point between Washington and Orlando, where we used to live. Maybe that one was more opportunistic than creative. ✓ And there nothing quite like Remy’s on a Disney cruise, a multi-course meal with a wine pairing. Chef Arnaud Lallement of l’Assiette Champenoise, a Michelin three-star restaurant just outside Reims, France, and Chef Scott Hunnel from Victoria & Albert’s at Walt Disney World Resort, created the menu. Remarkable. The ultimate in creativity is finding a grocery store or farmers market and creating your own food. It’s also a terrific way to save money. After several years, we started stepping out of our comfort zone by looking up local recipes and trying ingredients you can only find nearby. Of course, you can only do that if you can cook, so go for the vacation rental if you feel like putting your chef’s hat on. 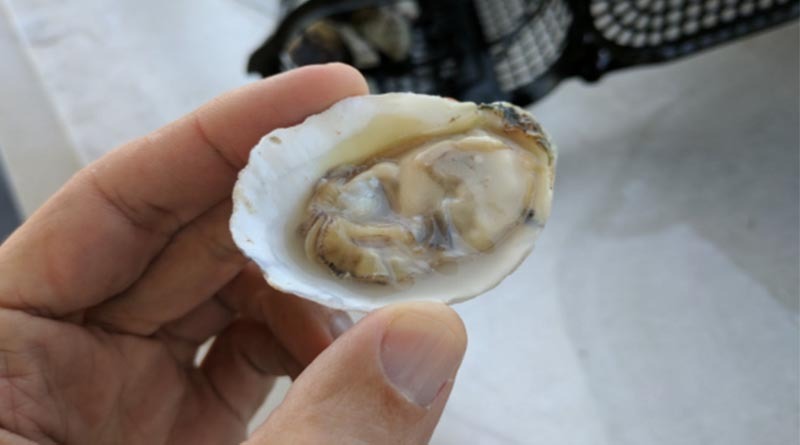 A raw oyster in Mobile, Ala. Dare you to try one. Whether you’re exploring street food in LA or dining at a restaurant with Michelin stars in Paris, food is an incredible adventure. That becomes clear when you’re exploring the outer range of the culinary arts, like sampling raw oysters in Mobile, Ala., or savoring frog legs in the Florida Everglades. It all starts with one of your kids saying, “I dare you to eat one, Dad.” I usually do. Attitude is important. If you approach food as if it’s an interesting part of your journey, your family will be far less likely to fight about it. For an added challenge, try doing it with a dietary restriction — kosher, halal, vegan. That’s where things get really interesting. I’ll have to write more about that later. You can avoid a food fight on your next vacation if you plan ahead and think outside the box. You know, the one that says “takeout” on it and has the hot dogs and fries. It’s no guarantee, but I’ve been on the road with my kids for the last eight years, and none of them has starved — yet.